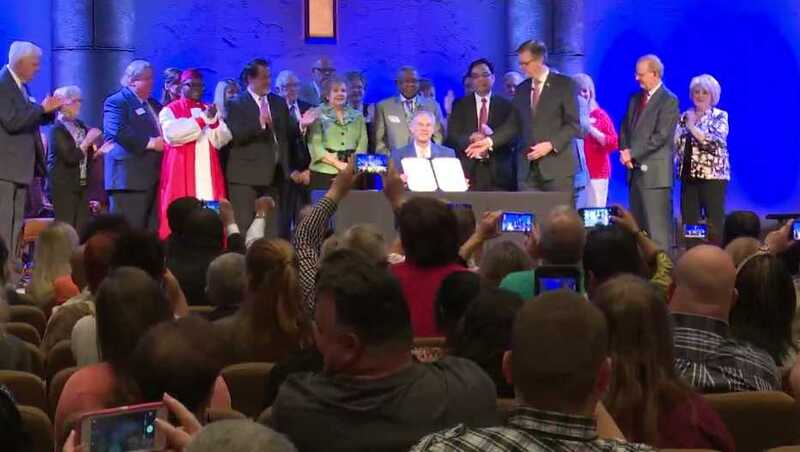 THE WOODLANDS, Texas — The governor of Texas has signed into law a bill that prevents the government from subpoenaing copies of sermons or questioning pastors about the content of their messages. A motion was soon filed in turn to stop the city from scrutinizing the speech of area pastors, which caused Parker’s attorneys to alter their demands. The clergy members who were the subject of the city’s discovery requests then sued Parker for “trampl[ing] on the rights of one million Houston citizens” through the subpoena requests. Uproar over the matter spurred lawmakers to present legislation that would prevent such situations in the future. “A governmental unit may not, in any civil action or other civil or administrative proceeding to which the governmental unit is a party, compel the production or disclosure of a written copy or audio or video recording of a sermon delivered by a religious leader during religious worship of a religious organization or compel the religious leader to testify regarding the sermon,” read Senate Bill 24, presented by Sen. Joan Huffman, R-Houston. While the bill was signed into law at the governor’s mansion on Friday, a special ceremony was also held at Grace Church on Sunday, with Lt. Gov. Dan Patrick also attending.